Val Head - Designer, Consultant, Web Animation Smarty-pants. So, you want to be a speaker? Are we creating the problem? Join The UI Animation Newsletter for weekly web & UI animation resources! Val is a designer and web animation consultant with a talent for getting designers and developers alike excited about the power of animation. She is the author of The Pocket Guide to CSS Animations and Designing Interface Animation. She shares her passion for animation and UX by curating the UI Animation Newsletter, hosting the All The Right Moves screencast, and cohosting the Motion and Meaning podcast. 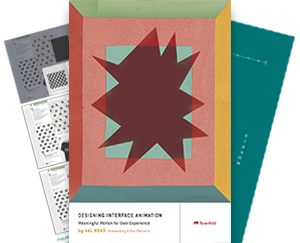 I just published a book on designing interface animation for the web. Get your copy from Rosenfeld Media! How does your brand live in motion?